As consumers, we like our containers. We like defined things. From frozen dinners in which everything has its own compartments to high-school cliques, we put things in the boxes we feel most comfortable with. Depending on where you are on the clique spectrum this can be a good thing or a bad thing (or, if you’re a real rebel, you might just not care). This happens with our entertainment as well. Is it a comedy, drama, action? We categorize so we can have a context as to what to expect. 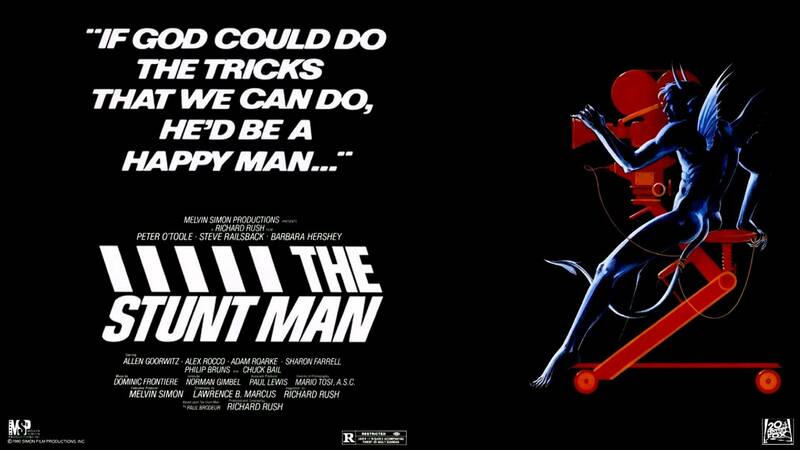 Lobby display poster for The Stunt Man. The tail between the legs is definitely intentional. 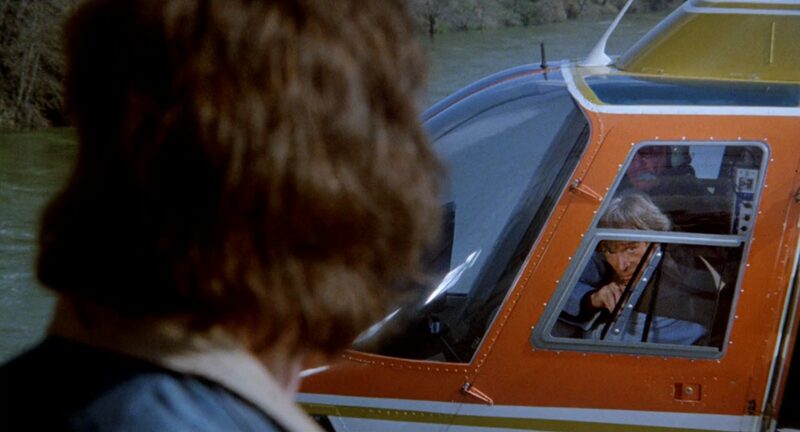 The Stunt Man follows fugitive (Steve Railsback) outrunning the police who stumbles across a film production and is hired by the director (Peter O’Toole) to replace a missing stunt man. 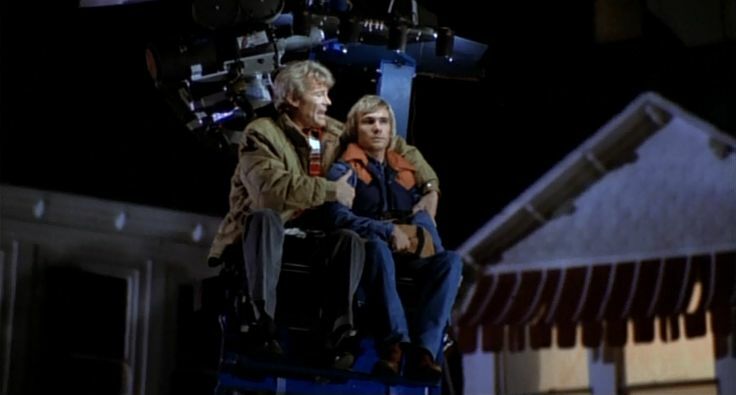 During the filming of stunts, however, he starts to think the director is literally trying to capture his death on screen. As mentioned above, this film falls under so many categories you don’t quite know what to expect from scene to scene. There is a method to the madness, though. Richard Rush directed another cult classic, Freebie and the Bean (worth checking out as well), but The Stunt Man is probably the pinnacle of his career. He tries to set up every scene so that it unfolds very deliberately. When a scene starts you might think one thing, but by the end it has shifted to something else, whether a lover’s quarrel that then ends up being a filmed scene for the movie within the movie or the serious story of a character that ends up being incredibly humorous. There’s a constant shifting. Steve Railsback. as fugitive Cameron, just hanging around. This shifting adds to the paranoia of the film, and the paranoia of Cameron (Railsback) as he tries to figure out what is going on. Is the director really trying to capture a death on screen, or is he just trying to get a great shot for a film that is over schedule and over budget? There are, of course, parallels between The Stunt Man and the film within the film. The latter is about the insanity of war, with World War I being used as a stand-in for the Vietnam War. Meanwhile, the book the real film was based on was released in 1970, and it took 10 years for it to make it to the screen; it definitely missed the high water mark of anti-Vietnam war films. The Stunt Man is a societal critique that, like the film being shot, is a war without a war. Peter O’Toole looks on as Steve Railsback possibly ruins a shot. All this is tied together and commented on in the film. Peter O’Toole, in an Oscar-nominated role, captures the spark and megalomania of fictional director Eli Cross perfectly. In a line that was used in the marketing campaign, he says, “If God can do the tricks that we can do, he’d be a happy man.” The scenes Cross is shooting take place in Europe but are being filmed in California, and he constantly has to worry about not getting palm trees in the shot—which, since Richard Rush is filming almost behind the scenes, he doesn’t have to worry about. Theoretically the trees won’t show up in Eli’s film. Peter O’Toole’s crane is almost a character unto itself. It can be fun to figure out how they shot the crane. Barbara Hershey plays the fictional film’s lead actress and love interest, Nina, and she walks the fine line between innocent and worldly. There’s a scene in the middle of the film in which she has been confronted about something and you just see her whole world shatter; she then uses that for the scene that is being filmed. It’s a well-acted scene and also interesting on a technical level to watch all the moving pieces around her. It’s an elaborate dance of sets and costumes that would probably be relegated to CGI in today’s Hollywood. Steve Railsback with Barbara Hershey. Railsback is in almost every shot of the film. The Stunt Man is a unique film. Considering its tour de force performance from Peter O’Toole and two additional Oscar nominations besides O’Toole’s (best director and best adapted screenplay), it is surprising that so many people haven’t heard of it. I guess it’s because it doesn’t fit into a box—I’ve spent 1,000 words on the subject and I still haven’t adequately described what the film is about. It’s one of those movies you just have to experience. It’s no surprise that The Stunt Man escaped at the same time as Michael Cimino’s Heaven’s Gate; they were both the swan songs of the New Hollywood, a time when directors were the be-all end-all. That’s not to say there havevn’t been auteurs since 1980, but starting around that time, directors didn’t have as much carte blanche as they had previously. This film is an experiment in melding many disparate forces that works incredibly well and should be seen at least once to watch what can be accomplished when trying to juggle a lot of different pieces.